We print everything at Ashley House, from the smallest business cards to vast wall coverings. Our team have years of experience with large format print and know how to make sure sure that every project is a great success. One of our favourite recent projects involved a series of 9 meter banners for the Met Office. 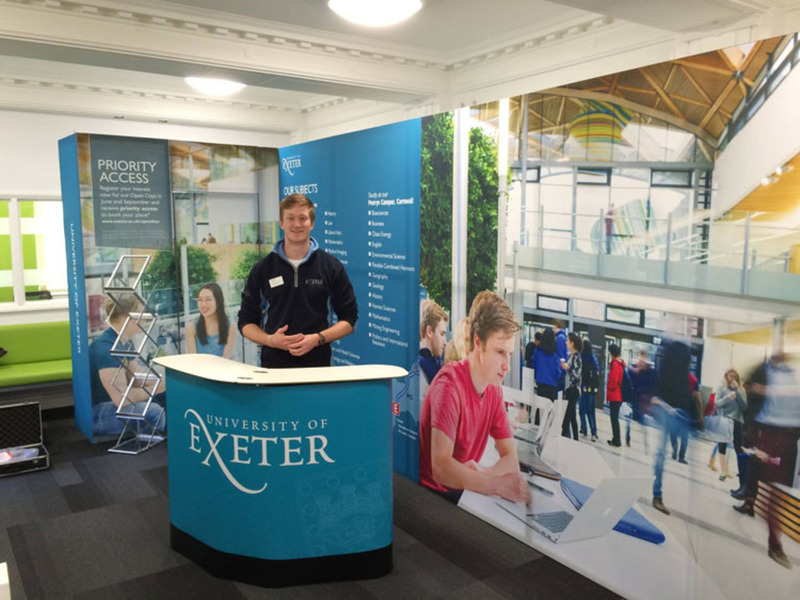 These eye-catching banners line some of the public spaces within their Exeter HQ. The flexibility of large format digital print means that almost anything is possible when it comes to bespoke wall coverings. The interior wall in our own large format print department features a panoramic scene of the Hong Kong skyline at night. As shown in our image above, scenes from the movies can also work brilliantly. Taking wall coverings in a different direction, this bespoke wallpaper was digitally printed from a design by the talented textile designer Alexandra Purnell. Alexandra is able to use the flexibility of digitally printed wallpaper to create a unique child’s playroom environment for her clients. We love our geek-chic coffee table. This is our own interior design masterpiece, comprising of a bespoke glass top with Space Invaders graphics, positioned on top of the design classic that is the Mac G5. Stunning vehicle graphics can be the most effective local advertising you can do. This delivery van for Jane’s Florist in Exeter features vibrant colours that really get attention. At Ashley House our team of design consultants can help you to create stunning vehicle artwork that makes people stop and take notice. 6. Something on an epic scale! Loseley House in Guildford, Surrey, required a period of extensive renovation, and was almost entirely covered in scaffolding. As a popular wedding venue, the building’s owners had to think creatively to ensure that the wedding photos still had the required ‘wow factor’. The solution was a vast, digitally printed PVC mesh, which entirely covered the building, featuring an image of the house in all its splendour. From a distance you can hardly tell that this is printed at all. What an amazing effect! Our team of specialists are able to work with you to create stunning artwork on a large scale. Whether you require simple roller banners, exhibition stands, wall coverings, or something more bespoke, call us on 01392 202320 and we’ll be happy to help.